The Middle East (Turkey, Iran and Syria) harbor two distinctive and unusual species of Pelargonium (P. quercetorum, P. endlicherianum). Two islands in the South Atlantic each carry one species. St. Helena (site of Napoleonï¿½s exile from 1815 until his death in1821) is home to P. cotyledonis, while Tristan da Cunha has one species ï¿½ P. acugnaticum (often considered the same as P. grossularioides). ornamental, flowering garden-plants. As bedding plants the zonal geranium (P. x hortorum) is the hands-down winner. Of lesser popularity are the regal geraniums (P. x domesticum) and the ivy geraniums (P. peltatum). Wherever Pelargoniums are grown ï¿½ one or more of these types are likely to be found. In fact, all of these types have their origin in southern ï¿½ really South ï¿½ Africa. While all three of the species mentioned are complex hybrids (involving two or more naturally occurring species or a combination of several naturally occurring forms in the ivy geraniums ï¿½ intercrossed with P. x hortorum), all of the contributing species are native to South Africa. 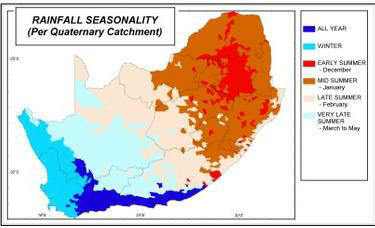 South Africa has three main rainfall areas ï¿½ and the season of rainfall determines cultural requirements when plants from these areas are brought into cultivation. The southwestern part of the country is characterized by winter rainfall; the eastern and northern parts of South Africa have summer rainfall with an area along the coast which can have rainfall anytime during the year. The winter rainfall area defines the area of Mediterranean climate and this is the area with the greatest number of Pelargonium species (more than 250 spp.). 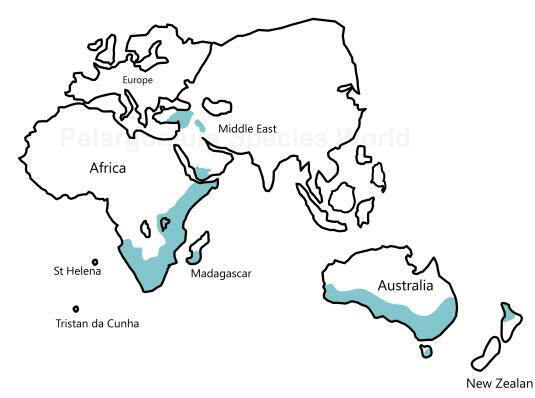 Pelargonium species extend up the eastern side of the African continent as far north as Ethiopia and Somalia. A couple of species extend across to Yemen. Beyond the African continent, Australia carries the next largest number of species with about seven being found there. One species is found in New Zealand (P. inodorum). For comparison, the genus Geranium is more widespread with 139 species in South America, 105 species in Asia, 54 species in the Mediterranean basin, 50 species in North and Central America, 25 species in South Africa, 9 species in East Africa and 11 species in Australia. The other genera of Geraniaceae are quite restricted: California has one species in North America; Erodium, primarily in the Mediterranean basin, has 53 species; Monsonia/Sarcocaulon in southern Africa has 34 species (with a couple more species in East and North Africa). Hypseocharis (sometimes now considered part of the Geranium family) has 9 species in South America in the Andes from Peru to Bolivia and northern Argentina. Within South Africa, the species of Pelargonium are most common in a vegetation type called fynbos (dominated by low shrubby plants with fine leaves [about 600 species of Erica] and many species of proteaceous plants). Most species of the geophytic section, Hoarea of the Geranium family are found here and in the Succulent Karoo, just to the north of the fynbos. This vegetation type is dominated by annual daisies and succulent plants in the Aizoaceae and Crassulaceae families. One wonders about the number of specialized species of Pelargonium found in the south and southwestern areas of South Africa. What factors account for the diversity of species found in this relatively small area of the Earthï¿½s surface? The Cape Floristic Region is unusual for its large number of species, the majority of which are endemic ï¿½ meaning they are found nowhere else on Earth. Of 8,500 species found in the fynbos, about 80% or 6,000 are endemic. A number of ideas have been put forward to help explain this diversity. The following list is from P.D. Stilingï¿½s textbook Introductory Ecology (1992). 1. Time. Communities and species diversify with time: more time = more species as more variations (mutations) occur within populations, they have time to become reproductively isolated and then extinction removes the intermediate types. Where Pelargoniums live is a very old landmass, being more than 50 million years old. 2. Spatial-heterogeneity theory. Spatial heterogeneity refers to the complexity of the geology/geography of an area which allows for a diversity of habitats and microclimates. 3. Competition between different populations/individuals has the effect of narrowing the breadth of niches of each species allowing for more specialized requirements for each species. 4. Predation. Predators (including herbivores) and parasites limit the population size of the species so that more resources are available for the survivors. At least for this hypothesis there is experimental (observational) support. There are more species of grasses in areas that are subject to heavy grazing. 5. Climatic stability. Stability of the climate allows for the survival of more species in contrast to areas with harsh and changeable weather and climate which eliminates individuals, i.e. the tropical vs. temperate regions. It has been known for a long time that there are more species in tropical areas as compared to temperate regions. 6. Animal pollinator theory. Where there are specialized animal pollinators there is a greater chance of reproductive isolation occurring and thereby increasing the rate of speciation. In the Cape Floristic Region, there is a plethora of specialized and unusual types of insect, bird and mammal pollinators as compared to temperate North America, Europe and Asia. These last two ideas may help explain diversity elsewhere but do not seem to apply in South Africa. 7. Productivity theory would seem to apply primarily to animals. An area of greater primary productivity (meaning plants utilizing sunlight to produce more food, i.e. foliage, fruits and seeds) supports the existence of more individuals dependent on green plants (herbivores and the creatures that eat them) and potentially more species in that area. 8. Area theory. Where there is a greater land area available for creatures to live on, there may be a greater chance for geographic isolation of populations which could increase the chances of speciation. 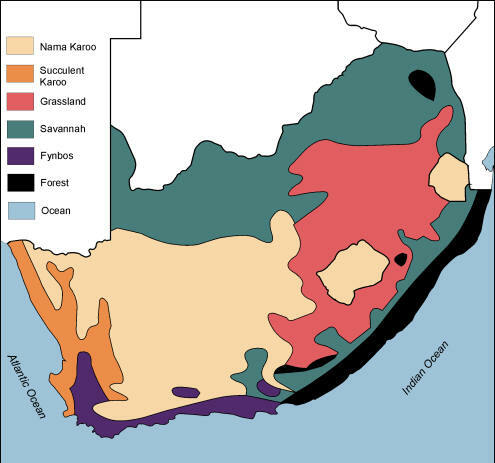 The Cape Floristic Region actually covers a relatively small land mass being a very small portion of the African continent. Of course, the effective area in which organisms can be physically isolated might be relatively small in the case of specialized insect pollinators. Unfortunately little in the way of field studies have been done in the past to test these proposals; so, for now, these ideas provide "food for thought". However, a number of research projects and researchers are now working in South Africa and other tropical areas to establish the applicability of these various ideas. In recent years (since 2000 to the present) several papers analyzing the Cape flora have been published. One by Linder (2003) seems to have the most ideas about factors acting to create the diversity we now find in South Africa. He puts forward the idea that climatic changes are the most likely explanation of the diversity. The climatic change is the result of large scale fluctuation between summer wet and summer dry climates. In addition there are diverse limitations to gene flow allowing for the isolation of groups and the development of new species. The limitations to gene flow include a dissected landscape, pollinator specialization and long flowering times allowing for phenological specialization. Further, the Cape has a richly complex environment with a geographically variable climate, a lot of altitudinal variation, different and diverse soil types, rocky terrain providing many microniches and regular fires providing disturbances and selecting for different ways of surviving fire.